In this article we are going to look at what is involved in successfully raising a puppy when you work full time. Leaving a puppy alone while at work is something you’ll probably be concerned about and you’ll want to be sure that your puppy is safe, happy and healthy if you plan to do this. We’ll talk about how long a puppy can be left alone during the day, what to do with your puppy while you are at work, how to crate train a puppy when you work and much more. Can I have a dog when I work? This article is not about whether or not people that work ‘should’ have a dog, we tackle that tricky subject in another article! You’ll find lots of information there, so if you haven’t got your dog yet, head over and check it out. I am often asked questions in the comments section, by new puppy owners that are leaving their puppy alone in the house all day. They are not sure what to do with their puppy while at work. They are having problems with house-training. Or problems with him chewing stuff, and with barking or howling while they are gone. 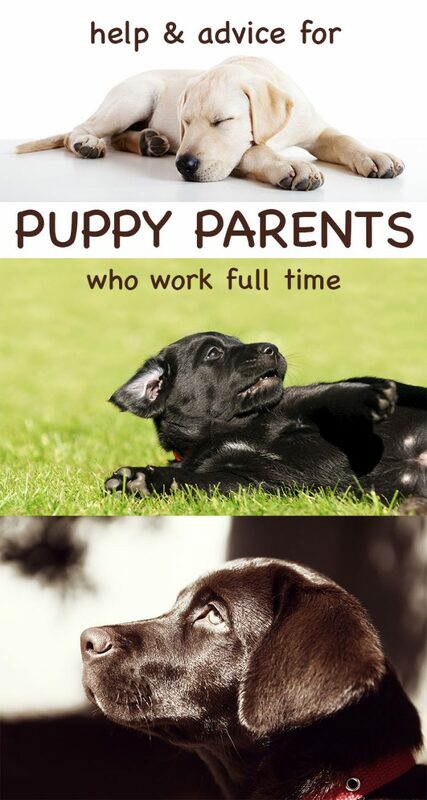 Let’s look first at some of the problems that can arise, when people attempt to combine a full-time job with a puppy. And at how we can help you to avoid them. A common problem in home alone puppies is ‘bed wetting’. The owner has read that crate training is a good idea, which it is, but has not read the part about the puppy’s bladder capacity. 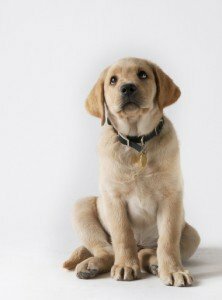 During the day, many 8-10 week old Labrador puppies have a tiny bladder capacity that can hold around an hour’s urine. Of course, there are some that can last much longer. But they usually belong to someone else. Some puppies will last not much more than twenty minutes at certain times of the day during the first week or so. As you can see, it is not possible to leave a brand new puppy in a crate for longer than an hour at most (during the day) without risking accidents. This doesn’t mean you can’t crate train your puppy, and we’ll talk about that in a moment. Does it matter if a puppy wets his bed? Does it really matter if the puppy wet’s his bed at this age? Won’t he just grow out of it? Well, yes it does matter, because once a puppy has wet his bed a few times, he’ll stop minding. He’ll also stop trying to hold on for a bit longer. This can delay the house training process considerably and even create a long term bed wetting problem. Which is of course, the opposite of what we want. Where is the best place to leave a puppy while you are at work? Nor can you give your tiny puppy the ‘run of the house’. He’ll pee and poop everywhere, and chew up your things. This means you’ll either need to puppy proof a safe room for him, or provide him with a playpen.